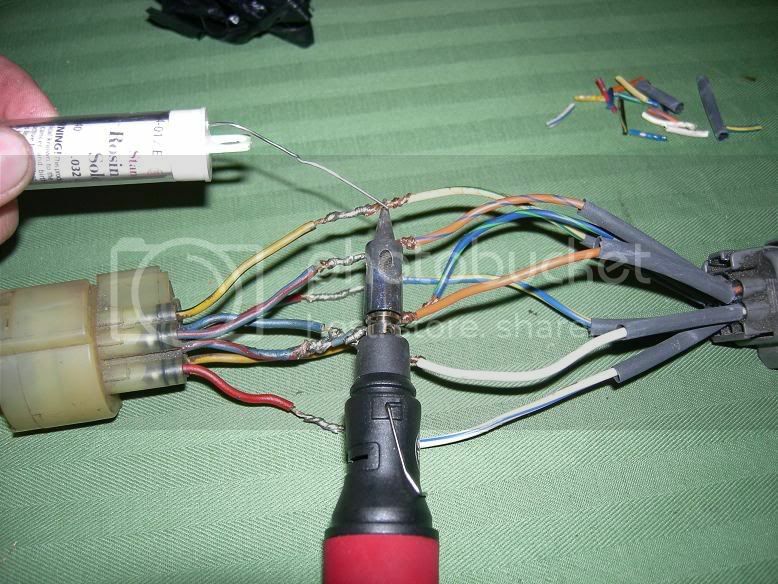 How To: Wire your own OBD-0 to OBD-1 Distributor Wiring adapter. Discussion in 'HYBRID -> ED-EF / DA' started by Andrew, Sep 6, 2006. 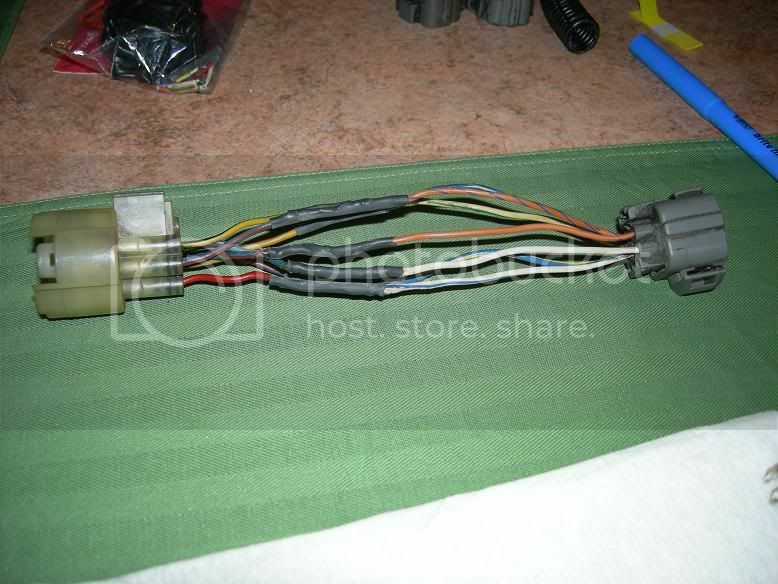 Heres how to make your own obd-0 to obd-1 dizzy adapters. It's kinda quick, but you get the idea. WIRE COLORS ARE NOT THE SAME AS YOURS. DON'T GO BY MY WIRE COLORS!! 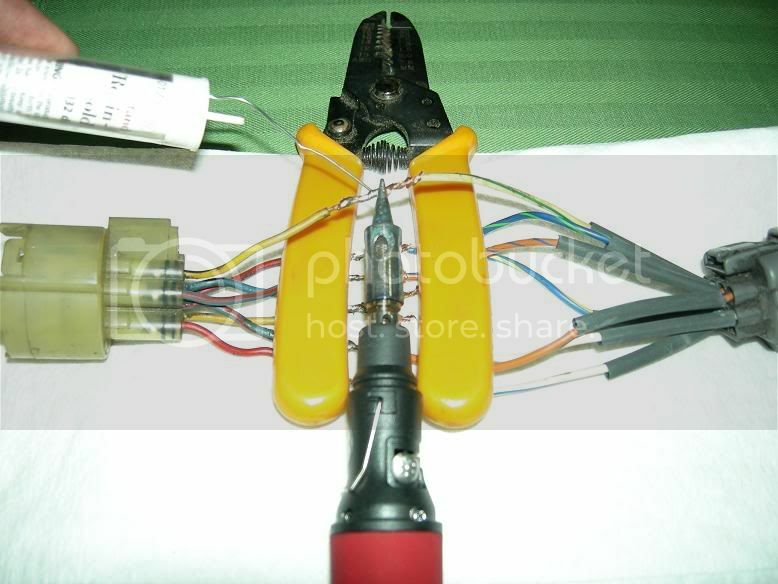 -Soldering gun/iron. I've had a few, and this is my favorite. it's a butane one from RadioShack for $20. -Time. It only took me about 30min to do it, but it's also my first one, and I took some extra time to MAKE SURE of my wiring before I soldered it. Please Take Your Time! 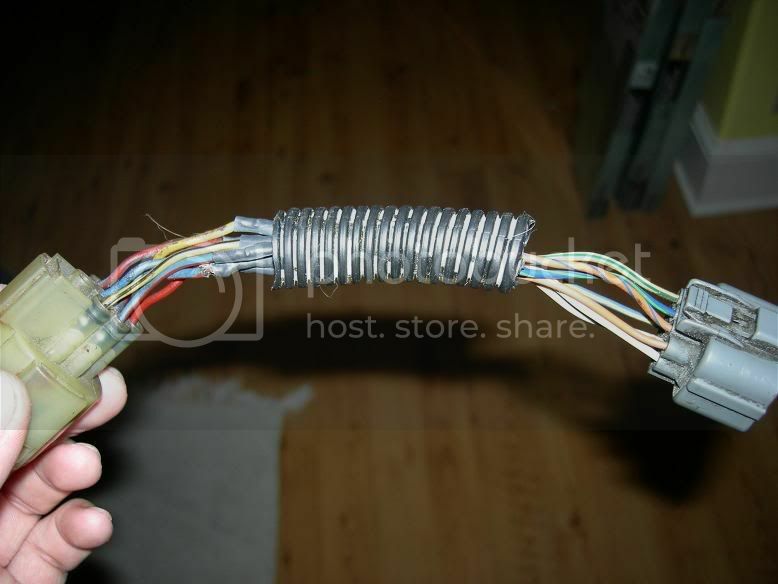 Use this picture for wire connections. 2. Useing Boomslang's Installation Instructions on page 6; If you don't have Adobe, use This PIC, and find the correct connection. *Note* Don't forget to slide the Heat Shrink tubing on before you get to soldering! And make SURE of your connections. 3. Start soldering after your SURE of your connections. 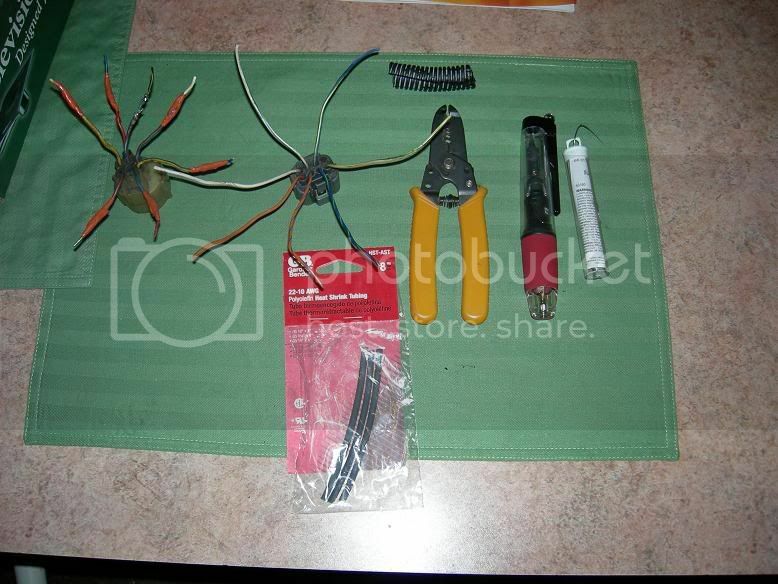 This helped me in the process of soldering the wires. I held the other wires down with the wire stippers. You can obviously use anything you want, but these were right in front of me. It just kept the other wires out of the way, and I didn't have to worry so much about burning them accidentally while focusing on the main wire I was soldering. 4. 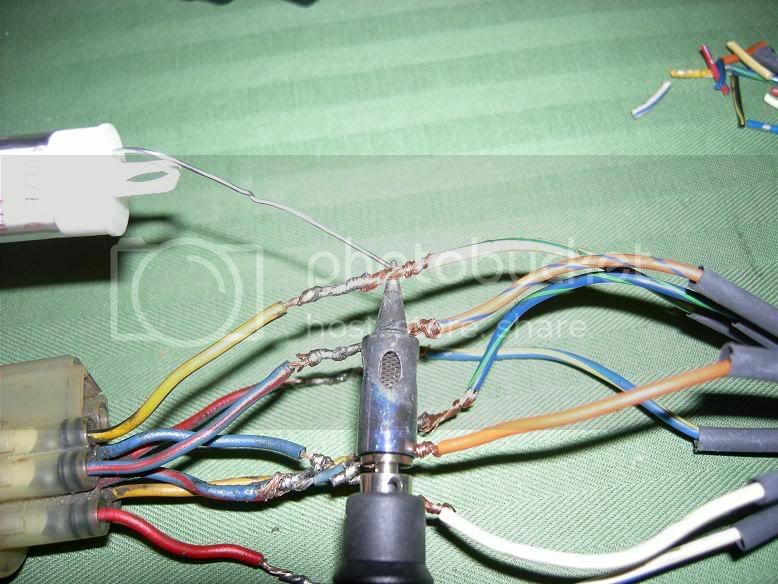 Now once you've finished wiring them all up, go ahead and heat-shrink the wires. If your not too familiar with the process of heat-shrinking, don't fret- it's a piece of cake. 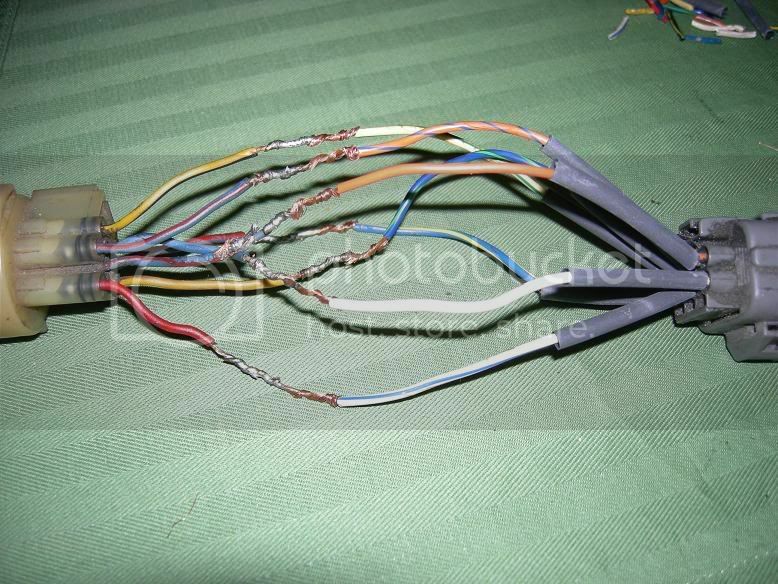 All you do is slip the tubing over the exposed wires and apply heat not directly to the tubing, but close to it. What I did was left my soldering gun on low and hovered it over the tubing, and it worked like a charm. Please enjoy, and tell your friends. Comments welcome as always. And don't forget to check my sig for other writeups too! lil_red_rex i do body work! well, yeah, but you see I didn't have the other(wiring harness side) obd0 plug to begin with. I bought this dizzy adapter but it was one of the worst wiring jobs i'd ever seen., and it was too short, so I rewired it with longer wires. Your right though, it would be easier to do it that way. Great job! One note- do NOT buy the heat shrink tubing that Radio Shack sells. It doesn't shrink worth a damn, and it melts under any kind of halfway decent heat. Buy the GB brand stuff from Home Depot. It's WAY better.... and is quite similar to the stuff that we use in a military spec electronics plant. Thanks for that bit on info bro. Simple. Because it's easily reversible. If you have a problem, or you want to sell the car, it's a plug n play ordeal. If you're smart, you'll do the same thing with the engine harness. So these pics are for obd0-obd1 dizzy wiring?How come you have a solid red wire when the diagram shows only the obd2 to have a red? The solid Red is on the OBD-0 side... the OBD-1 plug doesn't have a solid red wire at all...? I bought this as a 'conversion' harness adapter for the dizzy, and rewired it because it was originally connected badly(one twist and a shot of cold solder)..
Maybe he wired new wires/pins on it? idk. So according to this the difference between obd0 and obd1 is the obd0 large white and the obd1 yellow/green? Yep... but my wires are different colors. The guy I bought the adapter from evidently re-pinned the connector... or maybe he used an obd2 plug... idk. Is it just me, or are those plugs wired completely wrong? I'm not talking about the wire colors because obviously those are different. I'm talking about the pins. I have an OBD0 and an OBD1 plug in front of me, all the wire colors match up between them except the OBD0 has two white wires and the OBD1 has one white wire and one yellow/green wire. His red wire is white on my plug. He has it going to the white/blue on the OBD1?!! It should be going to his yellow/black. On my plug connector, both white wires are the same size. There is no "large" white wire. One of them is above the orange wire and below the empty pin. The other is below the orange wire. Which of these go to the yellow/green wire on the OBD1 connector? Once again, my wire colors are different. I bought this from a private guy selling dizzy adapters. He must have just pinned some random wires he had laying around. If you go by the wire chart ef8 posted(which is directly from Boomslang's manual), you can do it.